KL: Hi Shane and Emma. 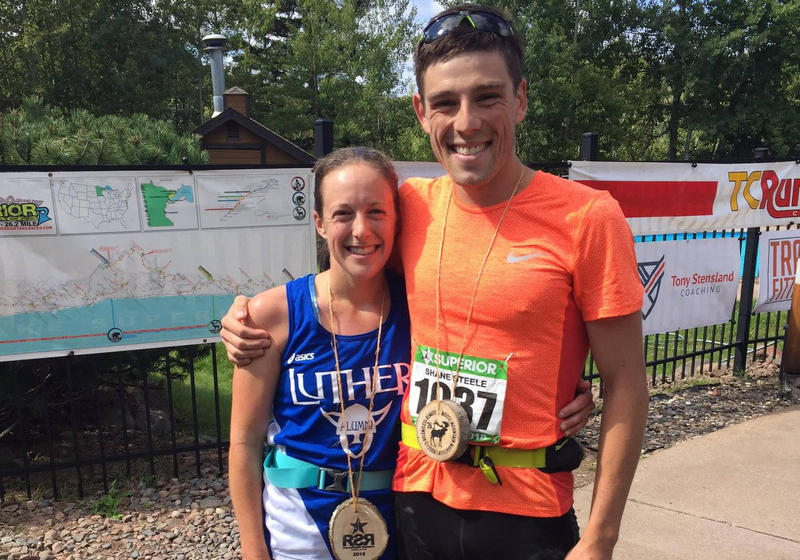 Congratulation to both of you for winning the Moose Mountain Marathon this year, and Emma, extra congrats to you for your second win in a row and new course record (Emma 4:07:40 and Shane 3:41:42). But first let’s back up a bit (and for those in the audience who don’t know, they are married to each other and they tied the knot just before last year’s race). How did you two meet? Emma: We both ran cross country and track and studied Biology at Luther College in Decorah, Iowa, graduating in 2012. I transferred to Luther midway through my sophomore year and didn’t connect with Shane until a year later when we took Botany class together. It took us three years of internships and further schooling before we settled on the North Shore together. I feel incredibly blessed to have a partner who enjoys running as a primary hobby and who has also added adventure to our lives through our traveling and climbing travels. KL: You live close enough (Grand Marais) to call this course your back yard. What part did that play in your training. Did the trail play a part in your decision to move to Grand Marais? Emma: We joke about “home field advantage” when we race on the SHT, but we have shown that the strengths we gain by running on the trail weekly translate to successful racing. We don’t run many of the race sections in our regular training, as we have our favorite sections closer to Grand Marais, but this year, we made a point to run most of the segments over the summer. On our final long run, we ran the Sawbill-Oberg segment and then to the top of Moose Mountain and back. For me, that was the most vital bit of mental training I did. I don’t think I had ever run Moose Mountain not in a race, and as a result, I had an aversion to it, and it has always loomed huge in my mind. Conquering it in training two weeks prior to racing it in the final 5 miles of the marathon shifted my mindset so that I looked forward to reaching the top. Shane’s family has a cabin north of Grand Marais, so we both had visited the North Shore prior to moving. Additionally, we hiked 200 miles of the SHT in the summer of 2013. Friends joked that two weeks of backpacking qualified as a “first marriage,” and I can’t disagree. We learned a lot about each other, and I fell in love with the trail and the North Shore through that experience. I still enjoy running the trail for the many memories that come with each segment. The trail is a living being that is always changing, and I never tire of running any bit of it. We are so blessed to have this trail with so many access points along the Shore and such a great network of volunteers who maintain it. KL: Do you train together? What does that look like if you do? Emma: We do our base training together. Throughout the year, we run together several times a week on average, enjoying miles wherever we find ourselves. This arrangement is more advantageous to me since I constantly have the presence of someone faster to pull me along and guide me through training. Shane writes our training most of the time, which I appreciate, and he will help me with speedwork and pacing at times. However, we both pride ourselves in preparing and racing for our own goals. KL: What challenges or differences are there to being a running couple? Emma: Running has been such an integral part of our lives that this shared passion is a common language. Prioritizing fitness and health is natural to us, and we build our daily lives and adventures around it. It’s a challenge when we are working toward different goals or one is nursing an injury while the other is in peak fitness. However, we have a built-in partner who can commiserate through the highs and lows. Shane: At this point, running is just a natural part of any day, like cooking dinner or brushing teeth. Since the marathon, we have been taking some down-time, and honestly that has been more of a challenge than training was. Emma: It goes back to being a student-athlete. Being in season and having a strict schedule with practices and meets to balance with academic work always felt good to me. When I back off from running, I struggle more with balancing my time and procrastinate more. I’ve been working to fill some of those gaps with cardio and strength classes at the YMCA, and Shane and I have been playing a lot of tennis. KL: What were your plans or goals for the race and how did the race play out for each of you? Emma: I had two primary goals, based on my race experience last year. The first was to fuel more effectively than last year. I didn’t carry food or water last year (other than a few chews that fit in my pocket), and I lost a lot of time as I refueled at each aid station. This year, we bought fuel belts, diversified the food we ate while training, and got comfortable drinking while on the run. I ended up getting through each aid station in 15-30 seconds this year, faster than I had even hoped. Having worked the Sawbill aid station for this past spring races, I had a better understanding of the volunteer set-up and was able to get my bottled filled quickly and pick up a few gels while moving. I really appreciated the leadership and communication of the volunteers to help me move efficiently. My second goal was to race the final section of the race. Last year, I struggled over the final 7.1 miles from Oberg to the finish, as I ran out of gas and took a bad fall. I focused on staying mentally positive through the first 20 miles with my eyes always up toward Moose Mountain. This helped me stay in control and keep a modest pace, and I felt strong as I left Oberg and headed back into the silence of the woods for a final time. I ran every step of the climb, which was a huge victory that I punctuated with a Shalane Flanagan victory cheer as I topped out back into the sunshine. I had déjà vu as I climbed Mystery Mountain and began to pay closer attention to my watch. I had hoped that simply decreasing my aid station times would bring me to the 4-hour barrier, but as I’ve reflected and compared to last year, I did not run as hard, especially early on. While Shane focused on finding marathon pace in training, I never pushed myself out of my typical distance speed. I realize now that breaking 4 hours will require not just smart fueling and detailed knowledge of the course but also peak fitness. I’ve got my next MMM goal all set. Shane: Two weeks out from the 2017 race, on a trail run north of Lutsen, I wrecked my back pretty bad and was out for about a month, so I had to scratch from the marathon. That was a huge bummer because I felt super fit from a solid summer of trail running out west. As a consolation, this past June with a little spring fitness and some long runs under my belt, I decided to solo the marathon course for fun. It went horribly. I was cooked before halfway but on a point of pride stumbled to the finish. Using that as a learning experience, my primary goal for this year’s race was to get to the Oberg aid station with enough in the tank to race the final 7 miles, hopefully for the win. Since Emma had set her sights on the CR, it must have subconsciously gotten wrapped up in my mind too. At the Oberg station, I came through feeling pretty good, not knowing how much I had the lead by and with about 57 minutes to go before the record expired. In the spring 25k, I have been able to cover that section of trail between Oberg and the finish in under 55 minutes, so I knew the record was probably gone. However, I had been running the whole race up to this point a little conservatively with this last section in mind, so I decided to go for broke and see how fast I could go. Turns out dehydration caught up with me on the top of Moose and everything fell apart real fast coming down into Mystery. Hanging on for the win was pretty lucky. Next time more fluids! KL: Shane, once you finished, what was it like to wait to see how Emma’s race played out? Emma: I take a long view on training and fitness-building. I didn’t have as long of a training block as I would have liked to prepare for this race, but I focused on the cumulative months and years of healthy running I’ve enjoyed without a major injury. I’ve found that maintaining a strong aerobic base throughout the year with running for mental and physical health makes sharpening for races happen quickly. I can’t deny that running on the SHT always gives me a confidence I couldn’t get anywhere else, but we traveled for 7+ weeks of the summer, and I drew on the strength I had gained from beach miles in North Carolina and long runs at 8,000-10,000 feet in Colorado. The diversity in my training and racing throughout the year keeps me excited about the next training block and race on my schedule. In the past year, I’ve run a personal-best on the track in the mile and a second trail marathon PR. Balancing a life of teaching, travel, family and friends, running, and climbing limits the number of races I run each year, but it also keeps me excited about new adventures to come. Shane: When I’m training for road or track races, I usually mix up the week with workouts and easy days and doubles. With trail running, I just go out and run trails, some days hard, other days easy. KL: What’s something non-running that helped you? Emma: In this particular race, two of my best friends surprised me by driving up from the Twin Cities to cheer me on. I had quite the shock when I reached the Sawbill Aid Station and heard familiar cheers. Maggie and Kayla were two of my training partners at Luther, and it gave me quite the adrenaline rush to have them show up. I smiled for the rest of the race, and I credit them with the extra motivation that it took to race hard the last two miles to eclipse my record from last year. Shane: We spend a lot of our free time climbing. Most weekends we’re out climbing on the Shore or up in Ontario, and we spend most of our summers and winter breaks out west climbing. This usually involves hiking with heavy packs for long periods of time at altitude, sometimes through deep snow. This is a great way to get strong, and the only downfall is that trying to get in a solid run after a full day of climbing is absolutely the worst way to feel good about your fitness. Emma: I did not have any significant low points. I’m grateful for that, as it leaves me hungry for another attempt at the distance, and I redeemed myself after the struggles I felt that I had in last year’s race with pacing, fueling, and injury. In hindsight, I felt too good for running a marathon, and I look forward to training with a more specific focus on pacing and trail speed soon. Shane: During the first 23 miles, none. The last three miles, after my delusions of a course record were behind me, I definitely hit a low point. But, I felt like if I coughed up the lead so close to the finish I would never be able to live it down. Plus, I knew that Emma would be taking home another big metal moose, so there was some pressure to bring mine home as well. KL: Bonus question: Please make your own question(s) (and answer) that reveals something you think we should know about. Emma: What is your favorite part of the race course? Of course, once I picked this question and began reflecting on it, I realize how hard it is to answer. This year, I most enjoyed the second section of the course. Cruising through the Temperance aid station gave me a lot of confidence, and I always enjoy the trail as it runs along each side of the Temperance River. There were a bunch of families cheering at the bridge crossing, and I enjoyed sharing a few high fives with kids before continuing on to Carlton Peak. The climb up Carlton Peak was solitary but satisfying, and I tried to use my hill strength to move well through that section and down the other side. Having the halfway point in the race punctuated with friends cheering was icing on the cake. Shane: (Answering Emma’s question) There are some technical rhythm-breaking stretches on the SHT section between Sawbill and Oberg. I love trying to cover that ground quickly even though it’s hard to keep moving fast. Other than that, the course is pretty straight forward. There are some really brutal sections of the SHT near Finland, north on the trail past Crosby Manitou SP, and north of Grand Marais near Judge Magney SP that are horrible to run. Terrible footing, super overgrown, lots of downed stuff (but no other people!). I like to get out on those sections of trail and just suffer through it. It gives a nice perspective for the easier sections of the SHT that most people are familiar with. KL: Thanks so much for taking the time to do this and congrats again!